Q and Not U brought their dynamic music to Canada for the first time on St. Patrick's Day, treating a slightly subdued all-ages crowd to their arty, punky sounds. They kicked off the show with the invigorating "When the Lines Go Down" and progressed almost seamlessly between songs. The trio must have raided a school music room at some point, breaking out the tambourine, bells, recorder and most importantly, the melodica to provide the sweetly satisfying ending to the addictive "Soft Pyramids." 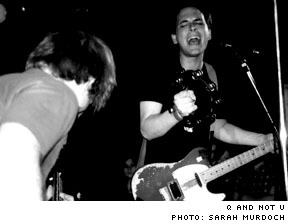 Q and Not U's set list did not stray far from their second LP, Different Damage. With Harris Klahr playing the synth instead of guitar, "So Many Animal Calls" seemed a touch hollow, and also too short. However, when he returned to the guitar for "Air Conditions," he did so with a vengeance. Christopher Richards became possessed as they gained momentum, and his demented actions, punctuated by "oowees," were mesmerising. Then the percussion took over, with Klahr joining John Davis at the drum kit. It was during these crescendos that Q and Not U were at their best. During the encore, Richards embraced one of the stage framing palms while singing about trees and carried it off, perhaps as a souvenir. Too bad nobody thought to remove them before the show, as it would have been nice not to have to peer through the fronds. Threedots played their confident math rock first, doing an excellent job of helping the crowd forget it was 7:30 on a Monday night, and Operation Makeout followed, sounding poppier than in the past. All in all, it was a pleasing night of punk-y trios.